This 100 year old Ameerpet Saheb Gurudwara is one of the best that was built with modern architecture. It has many devotees visiting this place from all over the world. This gurudwara has special rooms for pilgrimages where they can stay over on a visit to the gurudwara. Prior to the new gurudwara that was rebuilt with Sadh Sangat ji support, the old gurudwara was built some 100 years ago and is one of the biggest gurudwaras in the state with more than 2000 devotees. This area is surrounded by the Sikhs, who lives in and around the Gurudwara. Khalsa Panth Foundation Day is one of the important celebrations of the gurudwara. They also celebrate other festivals such as Prakash Utsav Of First Sikh Guru Sri Guru Nanak Devji and Birthday Celebrations Of Tenth Sikh Guru Sri Guru Gobind Sing in a lavish manner. In the year 2006, this gurudwara was praised for its majestic architecture during the visit of Punjab Chief Minister S Prakash Singh Badal and former SGPC president, Bibi Jagir Kaur who congratulated the prabhandak Committee for the construction of the intricately crafted Gurudwara. They praised them for maintaining the true culture of the Sikhs. For the first time in the history of the state of Andhra Pradesh the Governmant of Andhra Pradesh has built a modern multipurpose indoor stadium, named after The Tenth Sikh Guru 'Guru Gobind Singhji'. Like every Gurudwara, Gurudwara Saheb Amarpeet follows the Adi Granth and the Dasam Granth Saheb which plays a very pivotal part in the lives of the Sikhs since its inception. Sikh Rehat Maryada which is the Sikh code of conduct and conventions from the Sikh's living, Sikh's personal life, meditation is also followed here. The timings along with the schedule is given below for your visit. The Gurudwara conducts Morning Deewan and Evening deewan . There are also projects for construction of new Gurudwaras coming up. 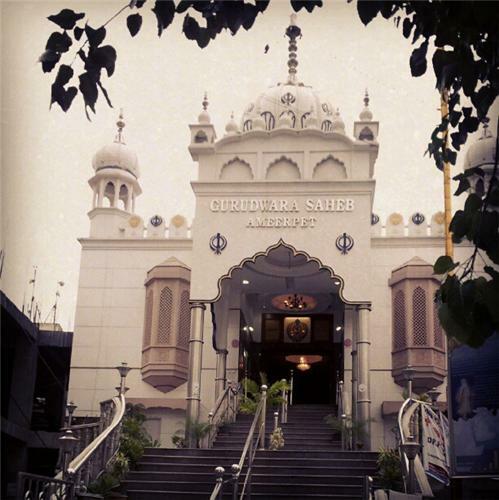 This Gurudwara is one of the biggest and if you are in Hyderabad take some time out to visit this religious place. Namashkar bhai mere namm akhil mei Gudwara Mandir jana chahtha hu mei hindu mei ja sakthe hey kya?? This is very beautiful Gurudwara in the city. I visit this Gurudwara almost every weekend. i will definitely visit the above gurudwara whenever i will be in hyderabad city. thanks for the information.